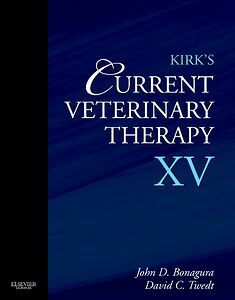 Written by today’s leading experts, Kirk's Current Veterinary Therapy, Volume XV keeps you completely current with the latest in disease management for dogs and cats. It uses a clear and practical approach to medical disorders; the typical chapter includes both a brief guide to diagnosis and a detailed discussion of therapy. You’ll gain quick access to information such as critical care; infectious, toxicologic, and dermatologic disorders; and diseases of the gastrointestinal, cardiovascular, respiratory, urinary, reproductive, neurologic, and ophthalmologic systems. 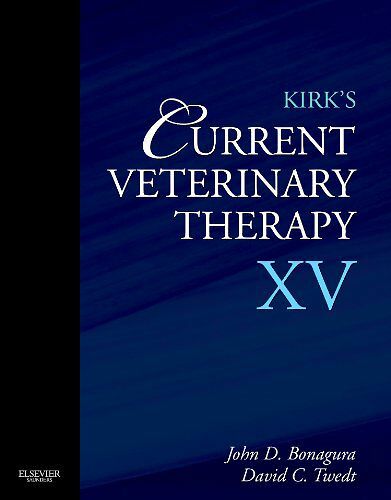 From editors John Bonagura and David Twedt plus hundreds of expert contributors, Kirk's Current Veterinary Therapy enhances your skills in evidence-based treatment planning. chapters cover the most important, emerging information on current diagnostic, treatment, and preventive challenges in today’s veterinary practice. Availability as Pageburst ebook allows you digital access to this volume along with your library of other Elsevier references.